Harrison Special Education Teacher Teresa Manfredo provided professional development instruction at our All Staff PD Fair in August. I want to thank Cañon City High School Counselor Kerri Kingery for coordinating an outstanding Fall Senior Parent Night last Wednesday. 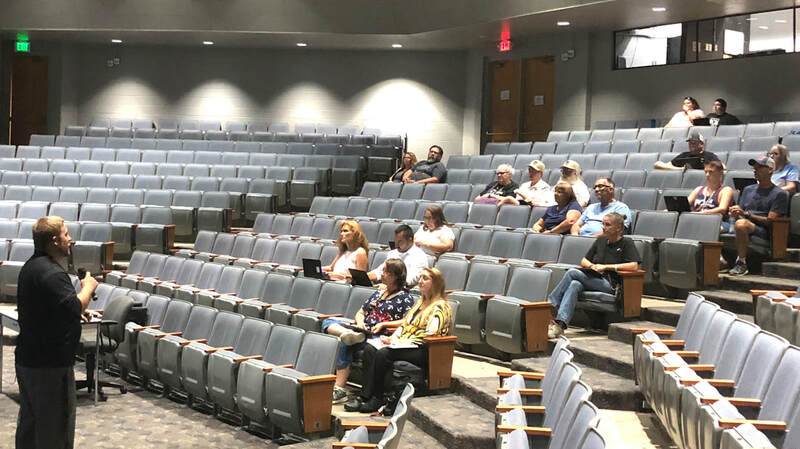 During the event, she and the rest of our high school counseling staff provided Class of 2019 parents with valuable information to navigate their child’s final year of public education. Sometimes meeting the social-emotional needs of students requires we reach out to support their parents, and this was an excellent way of doing so. Another prime example of our core beliefs in action was exemplified by Harrison K-8 Special Education Teacher Teresa Manfredo. The best way to tell this story is by sharing excerpts from an email I received from Harrison Assistant Principal Garrett Olguin. He wrote, “Teresa doesn't strike me as someone who seeks the spotlight. However, she certainly deserves kudos for what I observed this morning. When I approached, I saw Teresa working with an autistic kindergartner in a teacher prep area. The child was struggling and Mrs. Manfredo, with the patience of a saint, held them, comforted them, and eventually defused the difficult situation entirely. I motioned an offer to help, but Mrs. Manfredo signaled all was ok. By the time I left, the child was sitting calmly with Teresa. What an exemplar of core belief number 4! It would have been easy for Mrs. Manfredo to pass the child off to someone else, or to call the parent to address the situation. That’s just not Teresa's style. I have no doubt the situation was emotionally draining, but Teresa kept her cool and took care of that child in need in a way that would please any parent." Thank you, Mrs. Manfredo! And thank you Mr. Olguin for sharing this with us! I also want to pass on a story out of Mountain View Core Knowledge School. My understanding is an appreciative parent reached out to Director Karen Sartori last week, extremely thankful for the beautiful experience her child, one who has traditionally struggled to fit in socially at school, has been having. The parent said her child, “is like a whole new kid!” "Never have they been so happy and excited about school, each day coming home unable to stop talking about all that was experienced in the day. " Mrs. Sartori said the parent expressed that she now realizes what "the big deal" is about this little charter school that she has always heard so much about. Kudos to the entire Mountain View staff! On a final note, I want to thank the Harrison K-8 Title I Team consisting of Cassie Norden, Rhonda Lippis, and Amanda Dean-Moore for working diligently to complete beginning of year DIBELS Benchmark Testing last week. When one of your core beliefs states learning growth matters, a school community has to start from the perspective of where kids are academically when they arrive on the first day. Thanks to Cassie, Rhonda, and Amanda, Harrison teachers now know exactly where each child is and now they can focus on growing them from there! CCHS-PCC Automotive Instructor John Dustin poses with the Tiger Pride Car his class decorated. With our intense focus on preparing young men and women to be career ready, I’m pleased to share the PCC-Fremont/Cañon City High School Vocational Automotive Program has been named a top 20 finalist in the national Tomorrow’s Tech 2018 Program of the Year award. Over 90 high schools, technical schools, and colleges were nominated for this award, and PCC-CCHS instructor John Duston and his students have already garnered a top 20 finish! As a Top 20 finalist, the CCHS program has been invited to submit a video showcasing why they should be selected 2018 School of the Year. When this is ready, I’ll happily share it with Echoes readers. Should Mr. Dustin’s program wing this award, they’ll receive a collection of tools and prize money totaling $5,000. Wow! This week I also wish to echo an email addressed to high school staff recently by Principal Bill Summers. I can’t agree more with Mr. Summers. Though our teachers and students have been given an excellent resource, it's the human interaction that takes place in the classroom that makes all the difference. On a different topic, please note the Cañon City Council approved plans last week to repave Field Avenue from Central to High. My understanding is this process will begin soon and should take in the neighborhood of 45 days to complete. This will be quite disruptive to traffic flow at MVCKS and Harrison K-8. We in the school district had hoped this work could have been completed during the summer when school was not in session, but are hugely appreciate it is being done. For any parents and staff who travel this route on a daily basis, you’ll want to be aware of potential disruptions to your commute time. Be sure to plan accordingly, and please watch out for kids! A gigantic thank you is due Instructional Technology Coordinator Daniel Coppa for providing two excellent Chromebook parent instruction nights at Cañon City High School. Both were well-attended and provided parents with valuable information about our device program, and even a little hands-on instruction. My understanding is Mr. Coppa will give a follow-up session in about a month, after surveying parents about their continued need for support. Doug Abernathy from RTA Architecture shows how classroom, office, and common spaces might best be accessed as work continues on the CCMS school design project. Last week we held our second design meetings for both our Cañon City Middle School and Washington Elementary building projects. We're focusing on solidifying our building program, meaning double-checking what spaces of what type we'll need, such as how many classrooms, offices, workrooms, and large groups spaces will be built. We then shifted to actually plotting where significant spaces should be located for optimal student flow. If you can picture a chart of interconnected circles representing all these rooms, this is what we are in the process of creating. This work will eventually turn into sample floor plans. Director of Operations Jeff Peterson, our Owner’s Representative Chuck Jordan from RLH Engineering, and I attended Tuesday's City Council meeting to answer questions about our request to rezone the Washington property to allow for a new elementary facility. It appeared all went well, and our application was approved on first reading. The City Council will take this matter up again at its next meeting and approval at that time will mean we will be good to proceed with our project. Last Tuesday I began my day on KRLN Radio’s Morning Line discussing in detail with callers our future focus, then held a SAC meeting, and attended a quarterly PCC-Fremont Campus advisory committee meeting. I also reviewed student achievement data with Assistant Superintendent of Schools Adam Hartman and Director of Special Services Tim Renn, then attended our second CCMS and Washington new building design meetings. On Wednesday we held a central office staff meeting, I sat in on a state visit to our early childhood program, and attended part of a Regional Wellness Advisory Team meeting. On Thursday and Friday, I participated in a monthly CCEA officer touching base meeting and caught up on a lot of office tasks. Daniel Coppa oriented CCHS parents on our one-to-one Chromebook program. On tap this week is a plan work with Assistant Superintendent of Schools Adam Hartman on revising the Measures of Student Learning portion of our evaluation calculator, and to participate in a Building Excellent Schools Today Certificate of Participation (like bonds) sale phone conference to secure our match dollars for Washington Elementary. I'll also to attend a regular board meeting and work session, hold Superintendent Advisory Council and building design team meetings, observe the high school PTECH kickoff event, and hold a district leadership team meeting. Later in the week I'll observe delayed start professional development, begin updating district and school level Unified Improvement Plans on the Colorado Department of Education online platform, attend a quarterly CCEOE meeting, and attend a monthly regional superintendent's meeting. I enjoyed some biscuits and gravy with these McKinley elementary students. A young man named Darren was kind enough to take this picture for me! Last week I ate breakfast at McKinley Elementary School. While there I enjoyed the best darn biscuits and gravy available this side of the Rocky Mountains, provided by our outstanding nutrition services staff. I also visited some pretty energetic boys named Ryker, Aaron, and Trenton. As you may know, McKinley received a Colorado Health Foundation grant last year to construct a new playground, and their PTO also stepped forward last spring to invest funds allowing the school to implement a one-to-one Chromebook program two years ahead of the rest of our other elementary schools. Of course, I was curious to learn what these kiddos were doing with their Chromebooks, and Ryker seemed quite thrilled with a math application called iXL. Trenton said his favorite activity is reading books, then showing what he learned by mastering Accelerated Reader tests. I mentioned that I have extensive experience with educational technology, and back when I first used computers in classes my students absolutely loved a game called Oregon Trail. The response I received was three blank stares. I sure hope these boys don’t virtually die of dysentery or end up getting carried off by an eagle using the learning games they described!